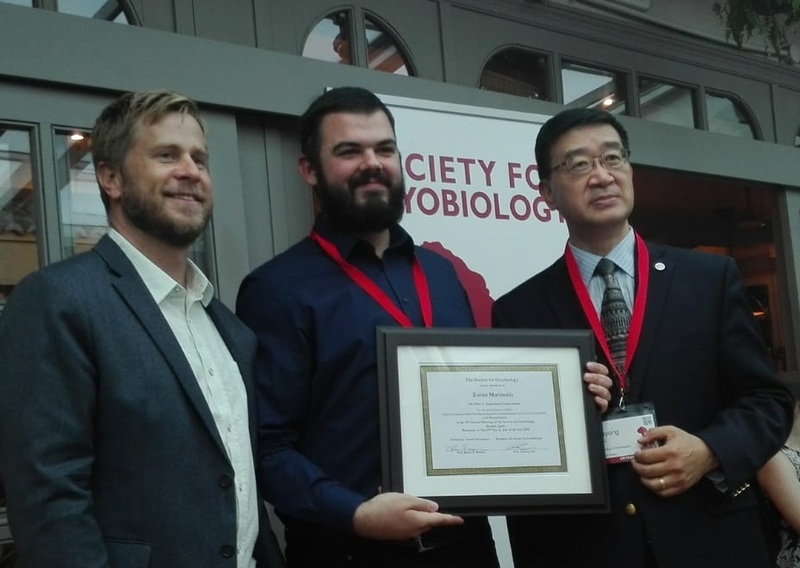 Zoran Marinović, a Stipendium Hungaricum scholar of the Department of Aquaculture, Institute of Aquaculture and Environmental Safety, Faculty of Agricultural and Environmental Sciences was awarded the prestigious Peter L. Steponkus Crystal Award for his presentation at the CRYO2018 conference held in Madrid, Spain on July 10-13th, 2018. The conference is the most important annual meeting of physicians, scientists and practicioners working on the cryopreservation of live cells and tissues, which is organized and overseen by the Society for Cryobiology. Zoran graduated from the Faculty of Science of the University of Novi Sad in Serbia and has been working at the Department of Aquaculture since 2015, first as a volunteer, then with the support of Visegrád Fund and finally with Stipendium Hungaricum scholarship as a PhD student from September 2016. His PhD ressearch topic is the cryopreservation and transplantaton of fish germ cells and his supervisor is senior scientist Ákos Horváth PhD. The title of his presentation was „Testis Cryopreservation and Spermatogonia Transplantation as a Tool for Zebrafish Line Reconstitution„. 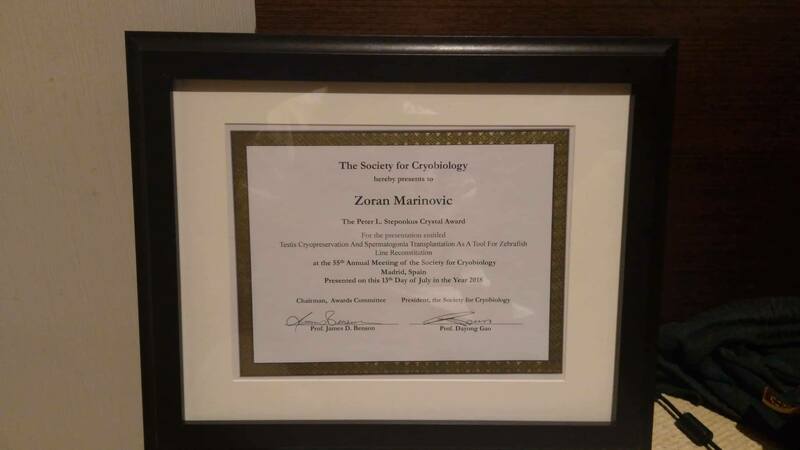 The Student Award Committee has nominated the top four applicants to compete for the Society's most prestigious student prize for the best oral presentation and finally selected Zoran Marinović the winner. Thus, he did better than students working at top-ranking universities of the world (University of Cambridge, Leibniz Universität Hannover). Congratulations, Zoran and lots of success to your future scientific career!